New MANDATORY NCHA Videographer's training video to be watched!!! Click on the "Support" link in the menu bar to see it. Code of Ethics and send it to the NCHA Director of Judges office! 1/16th Review Station Procedure calculation explained! Go to the "Support" page to learn more about it! If you are NEW, Unregistered Videographer...Please Click this LINK before taking the Certification Test!!! 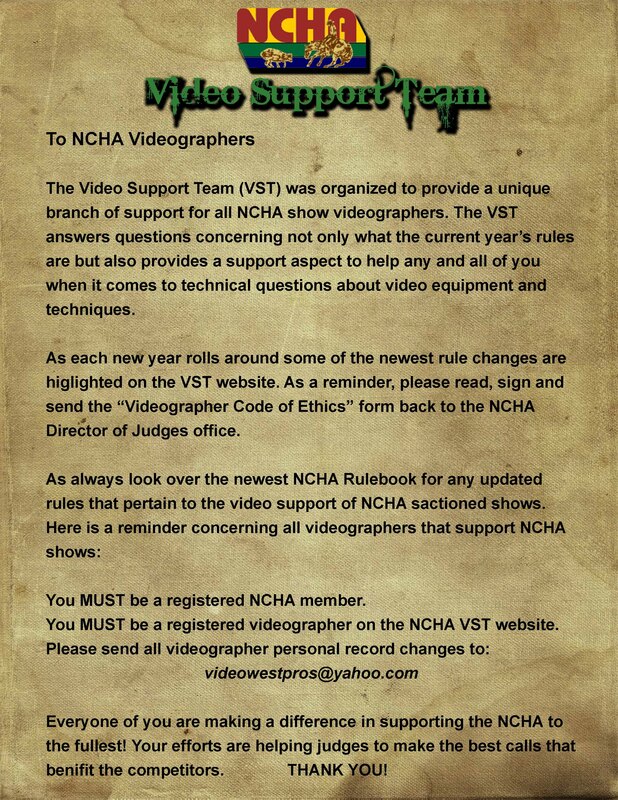 Welcome to the NCHA Video Support Team website! We hope that you find this service beneficial. 2019 © Copyright NCHA. All rights reserved. Designed and hosted by Video West Productions.